In order to ensure that every camera in a mocap system takes full advantage of its capability, they need to be properly focused and aimed at the target tracking volume. 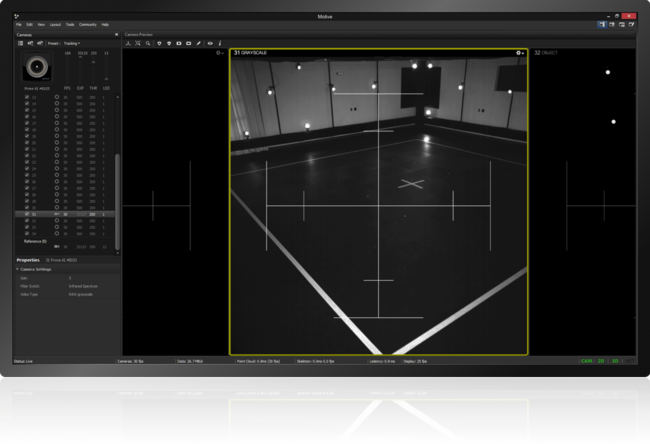 This page includes detailed instructions on how to adjust the focus and aim of each camera for an optimal motion capture session. 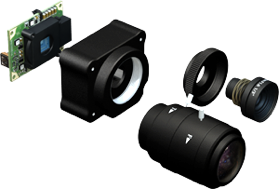 OptiTrack cameras are focused at infinity by default, which is generally sufficient for common tracking applications. However, we recommend users to always double-check the camera view and make sure the captured images are focused when first setting up the system. Obtaining best quality image is very important as 3D data is derived from the captured images. Make sure that the camera placement is appropriate for your application. Pick a camera to adjust the aim and focus. Set the camera to the raw grayscale video mode (in Motive) and increase the camera exposure to capture the brightest image (These steps are accomplished by the Aim Assist Button on featured cameras). Place one or more reflective markers in the tracking volume. Carefully adjust the camera angle while monitoring the Camera Preview so that the desired capture volume is included within the camera coverage. Within the Camera Preview in Motive, zoom in on one of the markers so that it fills the frame. Adjust the focus (detailed instruction given below) so that the captured image is resolved as clearly as possible. Repeat above steps for other cameras in the system. Adjusting aim with a single person can be difficult because the user will have to run back and forth from the camera and the host PC in order to adjust the camera angle and monitor the 2D view at the same time. OptiTrack cameras featuring the Aim Assist button (Prime series and Flex 13) makes this aiming process easier. With just one button-click, the user can set the camera to the grayscale mode and the exposure value to its optimal setting for adjusting both aim and focus. Fit the capture volume within the vertical and horizontal range shown by the virtual crosshairs that appear when Aim Assist mode is on. With this feature, the single-user no longer needs to go back to the host PC to choose cameras and change their settings. Settings for Aim Assist buttons are available from Application Settings pane. After all the cameras are placed at correct locations, they need to be properly aimed in order to fully utilize its capture coverage. In general, all cameras need to be aimed at the target capture volume where markers will be tracked. While cameras are still attached to the mounting structure, carefully adjust the camera clamp so that the camera field of view (FOV) is directed at the capture region. Refer to 2D camera views from the Camera Preview pane, and ensure that each camera view covers the desired capture region. All OptiTrack cameras (except the V120:Duo/Trio tracking bars) can be re-focused to optimize image clarity at any distance within the tracking range. Change the camera mode to raw grayscale mode and adjust the camera setting, increase exposure and LED setting, to capture the brightest image. 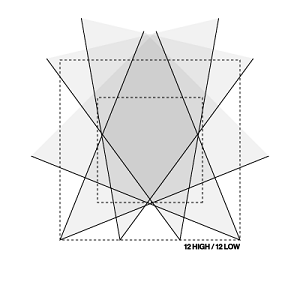 Zoom onto one of the reflective markers in the capture volume and check clarity of the image. Then, adjust the camera focus and find the point where the marker image is best resolved. The following images show some examples. For Prime 17W and 41 models, camera focus can be adjusted by rotating the focus ring on the lens body, which can be accessed at the center of the camera. The front ring on the Prime 41 lens changes the focus of the camera, while the rear ring on the Prime 17W adjusts its focus . Set the aperture at its maximum size in order to capture the brightest image. 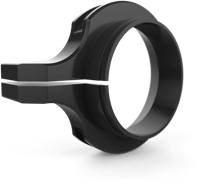 For the Prime 41, the aperture ring is located at the rear of the lens body, where the Prime 17W aperture ring is located at the front. 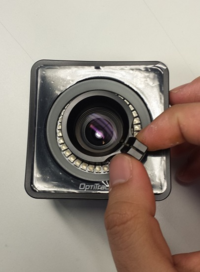 Carefully rotate the focus ring while monitoring the 2D grayscale camera view for image clarity. Align the mark with the infinity symbol when setting the focus back to infinity. Once the focus has been optimized, it should be locked down by tightening the set screw. Prime 13 and Prime 13W use M12 lenses and cameras can be focused using custom focus tools to rotate the lens body. 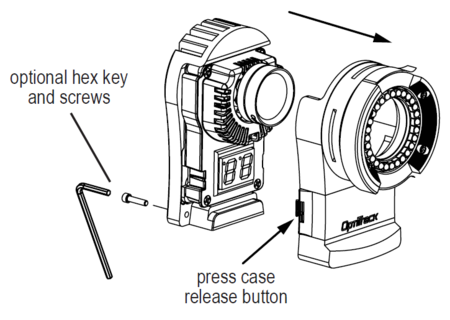 Focusing tools can be purchased on OptiTrack’s Lens Accessories page, and they clip onto the camera lens and rotates it without opening the camera housing. It could be beneficial to lower the LED illumination to minimize reflections from the adjusting hand. Focus tool for Prime 13W. Flex series cameras use M12 lenses. The camera focus is adjusted by rotating the lens body, and the camera lens needs to be exposed in order to adjust the focus. For Flex 3 cameras, unscrew the three hex screws located on the back and carefully remove the front housing. Flex 13 cameras, unscrew the two hex key screws and pull on the front housing while the case release button is pressed. The two hex screws are optional and the housing can be secured without them for easy access. The following diagram describes how to remove the housing in Flex 13 camera models. Note that the LED array will not be functional when the housing is removed, and the Flex 13 camera will rely on the LED illumination from other cameras while adjusting the focus. Removing front housing of a Flex 13 camera. Slim 13E cameras also feature M12 lenses. The camera focus can be easily adjusted by rotating the lens without the need to remove the housing. Slim 3U cameras are customizable. They support multiple lens types, including third-party lenses so focus techniques will vary. Refer to the lens type to determine how to proceed. (In general, M12 lenses will be focused by rotating the lens body, while C and CS lenses will be focused by rotating the focus ring). This page was last modified on 1 March 2018, at 17:56.